Guillaume Lacroix and Lawson Adkins with his plaque, and a bottle of celebratory wine. 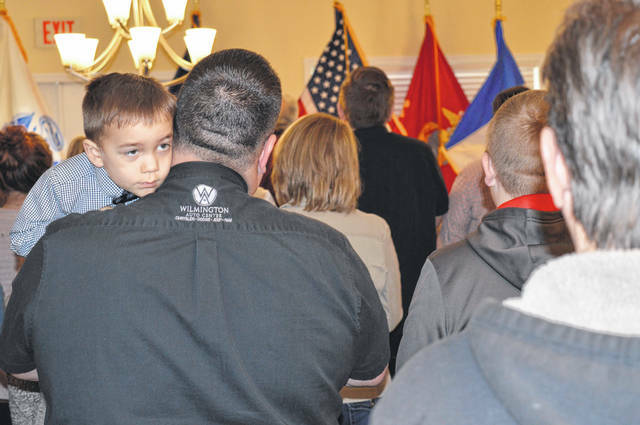 Multiple generations of Lawson Adkins’ family attended. David Adkins, grandson of Lawson Adkins, represents the family in speaking at the event. A large crowd packed Ohio Living Cape May Saturday morning. 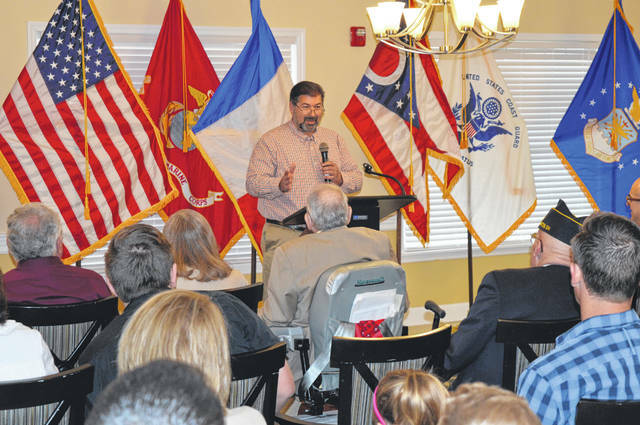 Paul Butler, veteran and good friend of Lawson Adkins, tells the audience about Lawson’s life experiences. 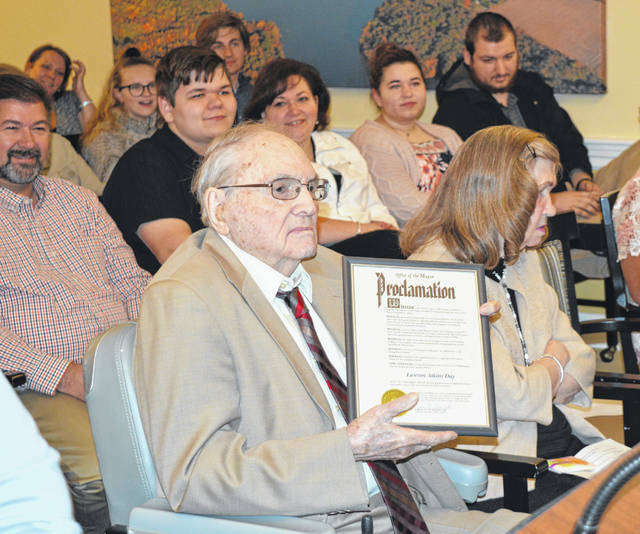 Wilmington Mayor John Stanforth proclaims Saturday, April 6 Lawson Adkins Day in the city. 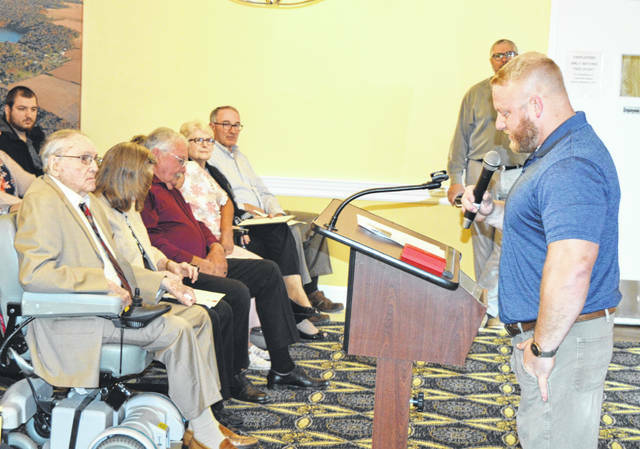 Lawson Adkins holds his proclamation from the City of Wilmington, surrounded by family. 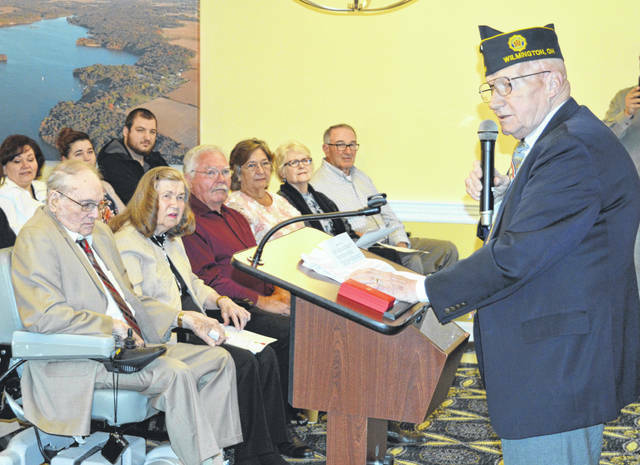 Local veteran Josh Sams was master of ceremonies. 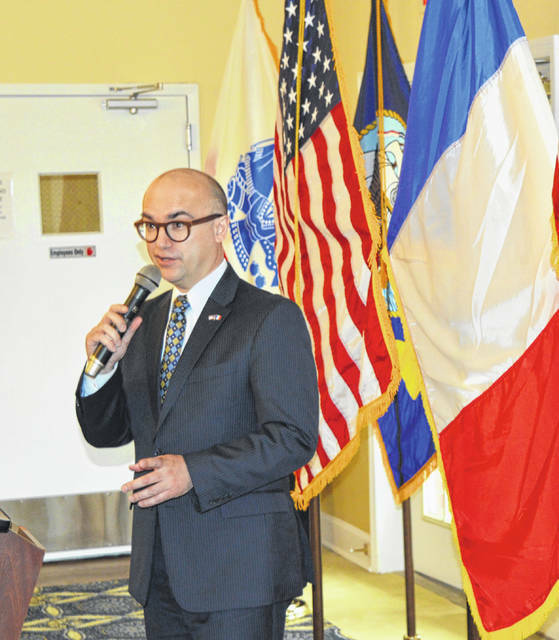 Guillaume Lacroix, French Consul General of France for the Midest, speaks to the audience on behalf of a grateful nation. Behind him are flags of the United States and of France. 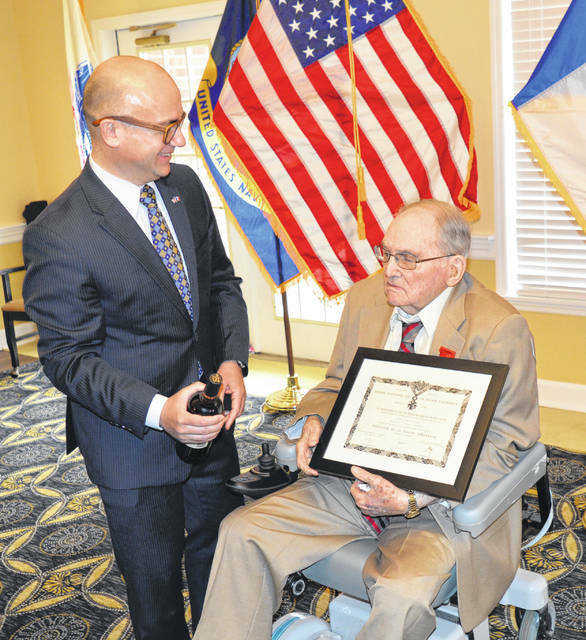 Guillaume Lacroix congratulates Lawson Adkins, who was nominated for the honor by local veteran Mac McKibben. 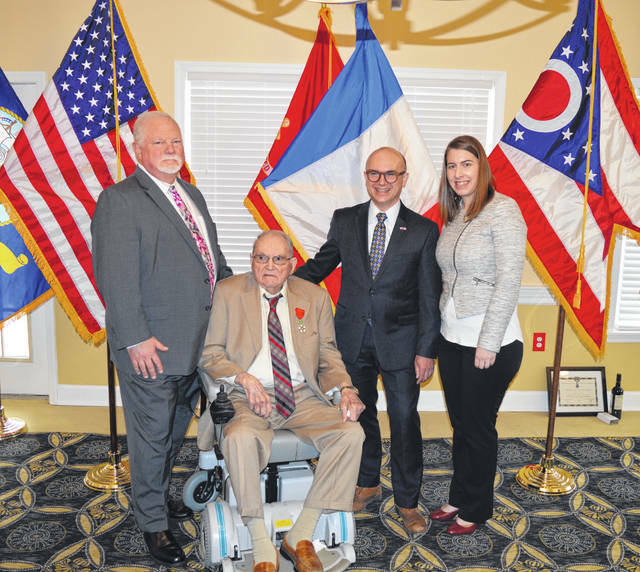 Lawson Adkins receives the honor from Guillaume Lacroix, Consul General of France for the Midwest, as family, friends and local veterans look on. Lawson Adkins speaks after receiving the honor as Josh Sams looks on. Lawson Adkins and Guillaume Lacroix. 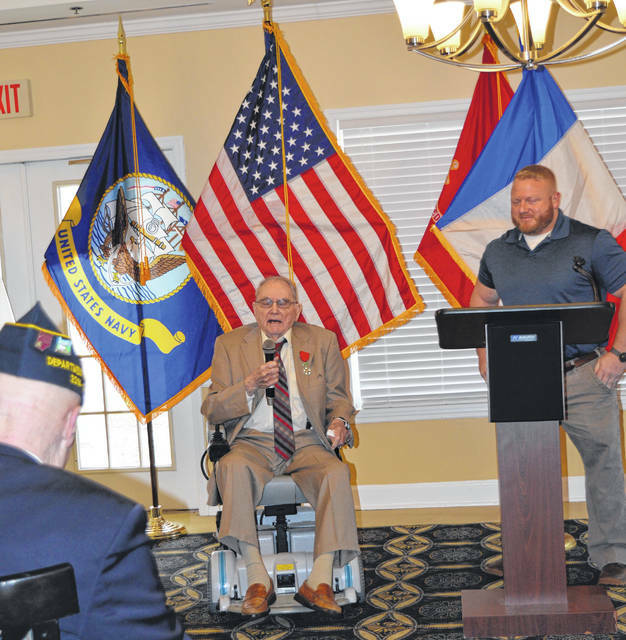 Representatives of local veterans organizations with Lawson Adkins and Guillaume Lacroix. 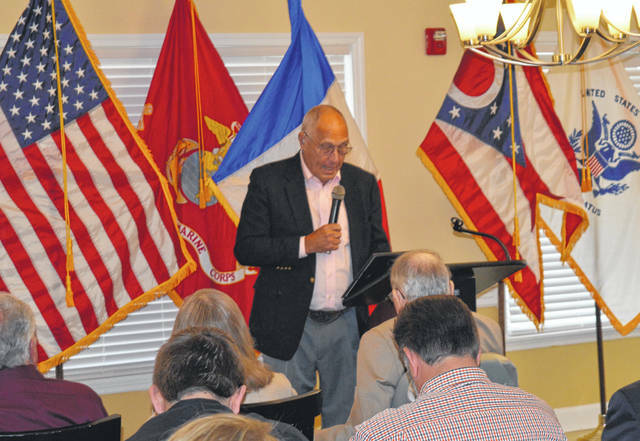 With Lawson Adkins and Guillaume Lacroix at Cape May, where Lawson resides, are Ohio Living Cape May Executive Director and Administrator Brad Reynolds and Ohio Living Cape May Director of Business Development Abby Ellsberry. Members of Lawson Adkins’ family join him and Guillaume Lacroix. From left are Guillaume Lacroix, Lawson Adkins and Mayor John Stanforth. Guillaume Lacroix pins the medal on Lawson Adkins. 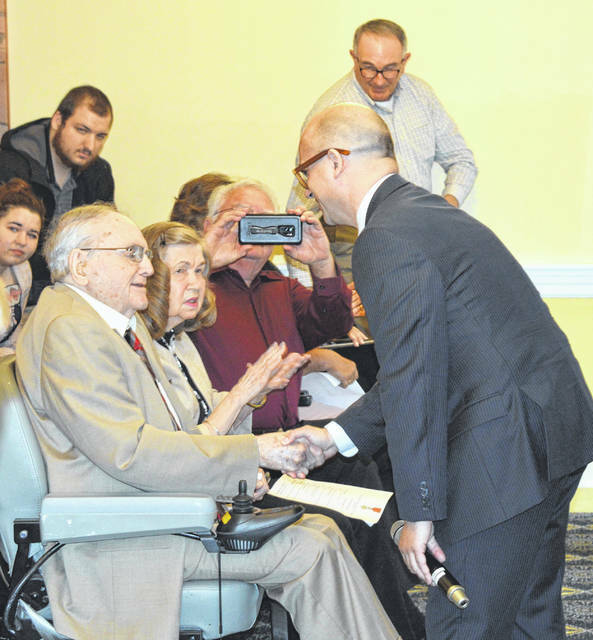 WILMINGTON — A grateful nation bestowed its highest honor on a local World War II veteran at a ceremony Saturday morning at Ohio Living Cape May. 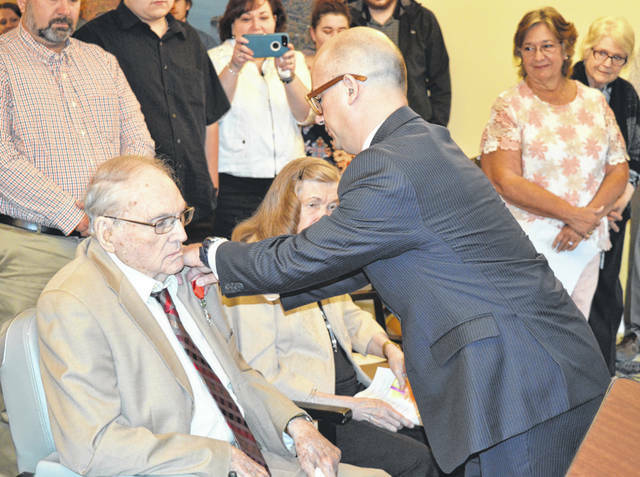 Lawson Adkins — surrounded as well by grateful family, friends and veterans — was awarded the French Legion of Honor by the government of France and its representative, Guillaume Lacroix, Consul General of France for the Midwest. “We are here to honor a true American hero, and also a French hero,” said Lccroix. 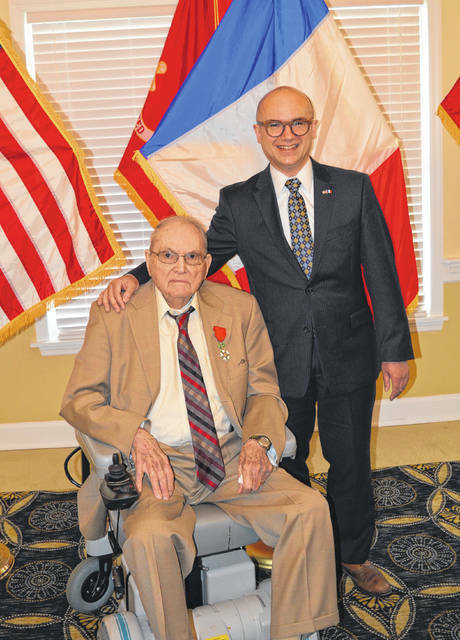 “It is not only me who says this, it is the French president.” He added that the French government was honoring Adkins “for his service, for the exceptional deeds he accomplished for our people, and for our freedom, and for our democracy. 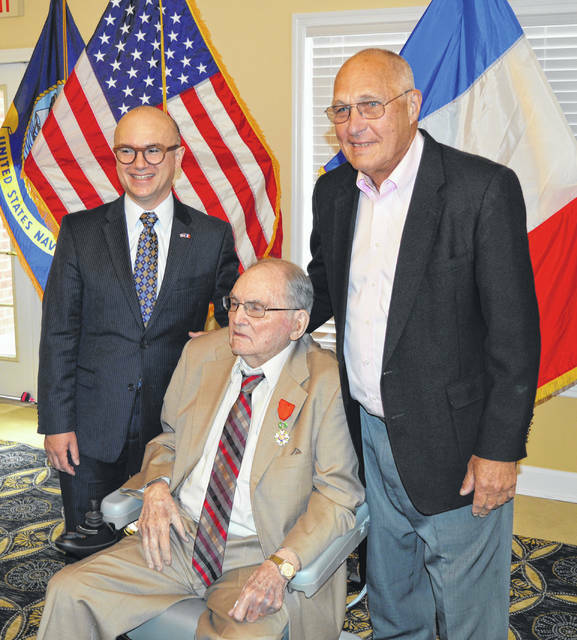 “The Legion of Honor is a big deal,” Lacroix added. 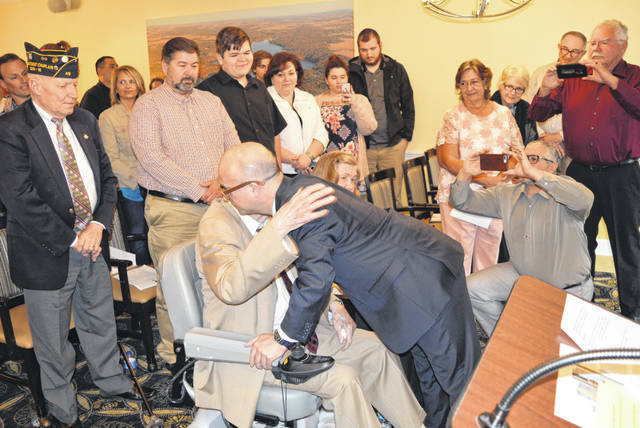 Adkins’ grandson spoke on behalf of the large family contingent that attended, recognizing Lawson’s devotion to his family as well as to the communities in which he has lived and his service to veterans throughout his lifetime. 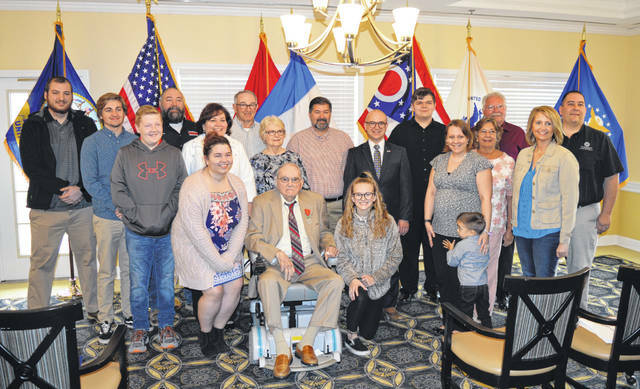 Paul Butler, local veteran and good friend of Lawson Adkins, shared stories and biographical highlights of Adkins’ life, many of which Butler shared recently in a feature story in the News Journal.